Higher education is undergoing a rapid transformation propelled by a confluence of factors. The conference provided a conversational platform to collectively consider how to position our universities for success in this new environment. World-renowned experts in education and globalization met with the leaders of top U.S. and international universities to discuss emerging circumstances that will soon change how post-secondary institutions view the world. Internationally-known thought leaders shared their observations, perspectives, and insights on the untapped potential for technology to dramatically expand access to higher education around the world. 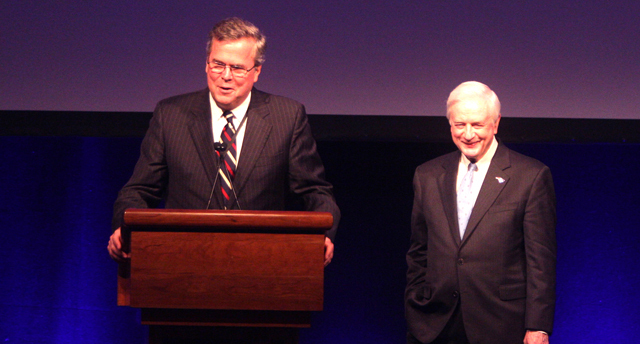 The Globalization of Higher Education conference was moderated by former Governors Jeb Bush (FL) and Jim Hunt (NC) who are known as education governors. These two ambassadors of expanding access to higher education convened and facilitated discussions at the conference, and focused on developing a sustainable model for post-secondary education. Governors Bush and Hunt support a strong future for higher education and believe that one of the ways it can be achieved is by expanding the reach of top quality brands to all global citizens. Education has the ability to expand opportunity and change lives. Indeed, there is no better way to raise standards of living and increase global prosperity than through broadening access to education from leading colleges and universities around the world. UNESCO and the World Bank attest that it is college graduates who are the principal drivers of economic development for nations; they design and build infrastructure, establish healthcare and education systems, create jobs across all sectors of the economy, and make agriculture sustainable. Conference speakers focused on the profound impact higher education can have on improving people’s lives, both in the developing and developed countries, and how the utilization of technology for the delivery of instruction is a key component of ensuring that everyone who would benefit from higher education has the ability to access it. Governors Bush and Hunt assembled an extraordinary group of world-class experts who shared their perspectives on the potential of globalization to transform the future of universities. They shared approaches to assuring the growth and success of leading universities around the world in a rapidly globalizing higher education market and engaged attendees in stimulating discussions. Attendance at the Globalization of Higher Education conference was by invitation only. Attendees included leaders of top U.S. and international universities, as well as political leaders, cultural thought leaders, influencers in post-secondary education, and dignitaries from the United States and around the world.